T3Desk is a great desktop application designed with a slick layout keeping your daily computing on track. By using a 3D desktop application like T3Desk, you add that extra dimension to your workspace, giving you more freedom to place objects where you want. As a 3D application, T3Desk can transform your windows and gadgets at different angles providing you more space to view what's important to you. 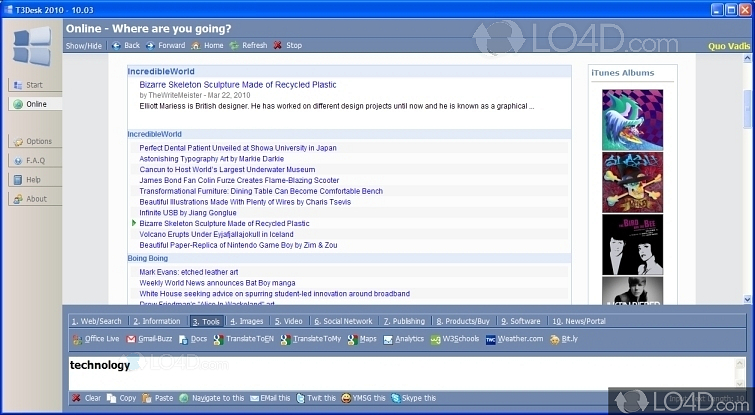 Options of this application can be setup in the main Options menu and from there, you have access to a variety of different options such as the animation, transparency, zooming, hotkey and sound options. You can also select between multiple supported languages. 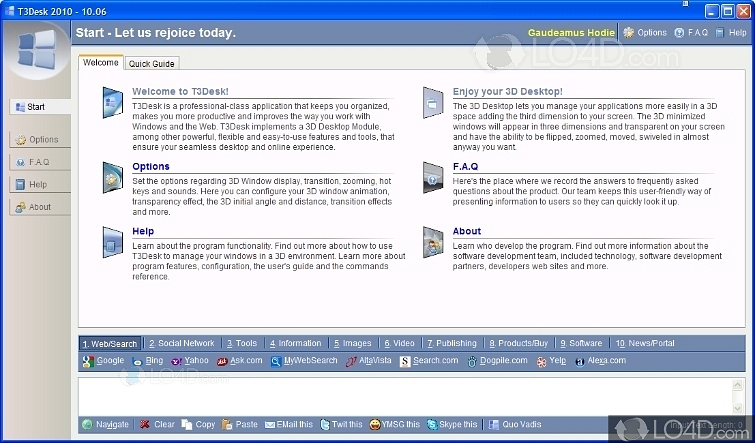 Also under the general options menu are the options of when to start T3Desk and whether you would like to disable 3D Windows. Unlike other applications of its kind like BumpTop, T3Desk uses very little system resources and runs rather fast without problems or activating a loud CPU fan (due to high CPU usage). Incase you didn't immediately realize it, to activate and use the 3D desktop features, you'll be required to click a little blue button to the right of the minimize button at the top of open windows. 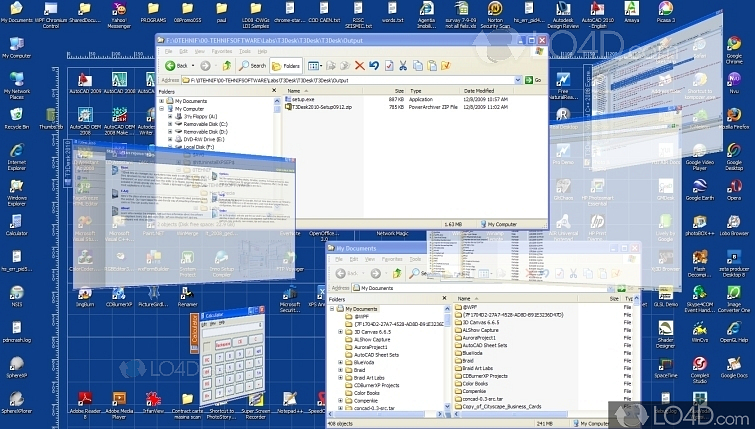 T3Desk is licensed as freeware for the Windows (32-bit and 64-bit) operating system / platform from windows customization software without restrictions. 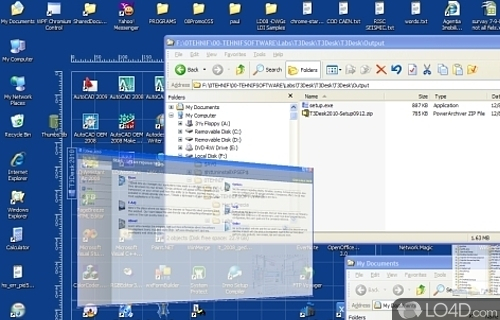 T3Desk 15.06 is available to all software users as a free download (Freeware). Compatibility with this management software may vary, but will generally run fine under Microsoft Windows 10, 8, 8.1, 7, Vista and XP on either a 32-bit or 64-bit setup. A separate x64 version may be available from Tehnif Software SRL. This download is distributed as T3Desk2014-Setup1401.zip and T3Desk2015-Setup1505.zip. We have tested T3Desk 15.06 against malware with several different programs. We certify that this program is clean of viruses, malware and trojans.